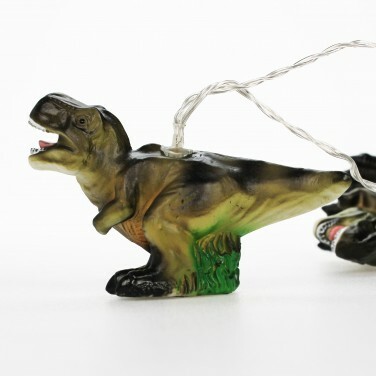 Add ferocious character and soft light to kids rooms with fearsome T-Rex dinosaur string lights! 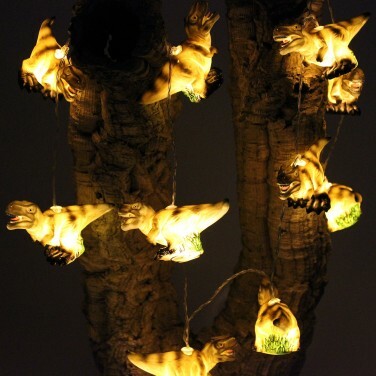 Wild and wonderful, add Jurassic vibes to your child's room with a set of T-Rex string lights! Ten mini T-Rex dinosaurs are lit with warm white LEDs to add comforting feature lighting to kids rooms. Battery operated, these ferocious lights can be placed anywhere and because they're lit with LEDs, the soft plastic dino's remain cool to touch making them safe for even the youngest of dino fans to hold.